Who were the Medellin Cartel? Back in the 1970s, Colombia was in a period of relative stability after decades of political violence and upheaval. And there was a fortune to be made in selling cocaine to Americans, especially if you could control every level of the business - flying coca base in from Bolivia, processing the stuff in Colombia and retailing it directly to the US consumer. That’s where the Medellin Cartel came into their own from 1976 to 1993. Highly organised and viciously ruthless, they built an empire that, at its peak, made more than $60 million a day. With so much at stake, violence became one of the key weapons in the Medellin Cartel’s political arsenal. It’s estimated they murdered at least 110,000 people during their reign. The majority of these killings were the result of bombings – of flights, cars, buildings and buses – but also included the executions of more than 5000 police, as well as anyone they suspected of subversive (i.e. Communist) or anti-Colombian tendencies. Pablo Escobar, the godfather of the Medellin Cartel, in Colombia in 1988. Pablo Escobar is the best-known name in the Medellin Cartel story, for obvious reasons. He was not only the leader of the group, he also gained a reputation for being the wealthiest criminal in history and a hugely popular figure in Colombia thanks to his generous investment in infrastructure and social projects. In the '80s, he oversaw the shifting of 70-80 tons of cocaine into America on a monthly basis, which led to him being imprisoned under ludicrously cushy conditions. Killed in 1993 on a rooftop by police, Escobar’s death marked a turning point in the cartel’s fortunes. Without his commanding, charismatic and connected presence, the group fell apart. A young Adelaide woman has been arrested in Colombia after allegedly being caught with cocaine in her luggage at the airport. But Escobar wasn’t the only major figure in this story. Carlos Lehder was the man who understood the importance of logistics. He took the low-rent operation he found in the mid-'70s and revolutionised the way they did business. Now, instead of sending drug mules on flights one at a time, they could fly their own small aircrafts at detection-dodging low altitudes. 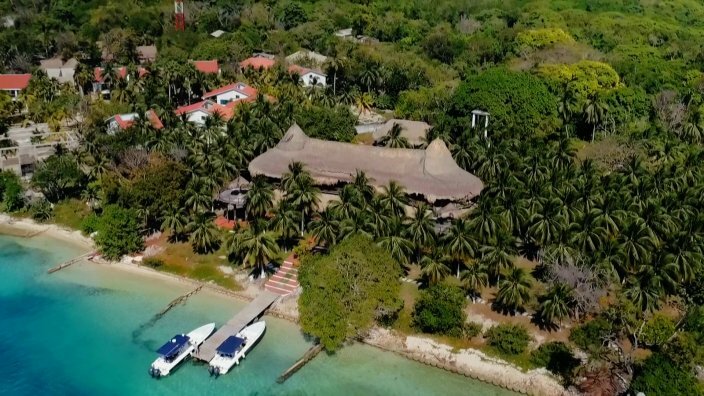 Business boomed – even more so after Lehder bought an island in the Bahamas to use as a combination midpoint for cocaine smuggling and hedonistic pleasure palace. Today, he’s rumoured to be in witness protection after becoming unstable and being handed over to American authorities, landing a sentence of life without parole plus 135 years in 1988. Carlos Lehder, the "star" of the Medellin cartel, in Colombia in 1988. Using his connections on the American side of the operation, Jung built the market and distribution for what the Colombians were making. He made millions, as you’d suspect, but wound up in jail for a 20-year stint after being arrested in Kansas with a ton of cocaine. Today, Medellin is still the centre of Colombia’s cocaine trade, but the terrain has completely changed over the past 20-plus years. It’s a far more fragmented industry, and there’s no major figurehead to do political battle in a landscape where local police and the American DEA have joined forces to take out anyone who pops their head above the parapet. If anyone’s buying islands or financing local soccer teams, they’re doing it quietly. And Pablo Escobar’s hippos are still causing trouble. There’s a lot more to Grylls than surviving the elements, skydiving, and eating frozen yak eyeballs. Be prepared to be spooked out of your wits at some of Scotland’s most haunted places. Out of the loop? These are the shows you should be watching. Trolling the easily panicked in the lead-up to new series 'House of Hypochondriacs'. What even is the Bronze Age? If you’re picturing Captain Caveman trading in his club for a blunt sword, you might wanna read this. The broken bad boys of SAS: Who Dares Wins. Hotties, sure. But your mum warned you for a reason.